Cochin’s international airport (CIAL) is not only the first airport meeting its energy requirement by solar power, but also the world’s first airport to use solar power as its main source of energy. India has once again proved that it is achievable! The Cochin airport which is the fourth largest in terms of international traffic in India, has installed an array of 46,000 solar panels spread across 45 acres of land. Now only is it powering the energy needs of the airport, but is also producing extra power to be sold to the Kerala state. Also read our take on Indian Transport to get Solar Power. The total installed solar power capacity in Kerala is now 12.025 MW as on January’16, from a mere 0.025 MW in May 2015 after the inauguration of this 12 MW plant near the airport in August’15. Now Cochin airport is producing ~50,000-60,000 units of electricity and is absolutely independent. The commissioning was done by the German company Bosch Ltd. Renesola modules of 265 W have been used, alongwith ABB inverters of 1MW capacity. The airport works on the PPP model, wherein CIAL gives the power it produces to the state electricity grid of Kerala and later buys the power when required. This plant has the capacity to meet the power requirements of more than 10,000 homes and reducing CO2 emissions equivalent to planting 3 million trees. 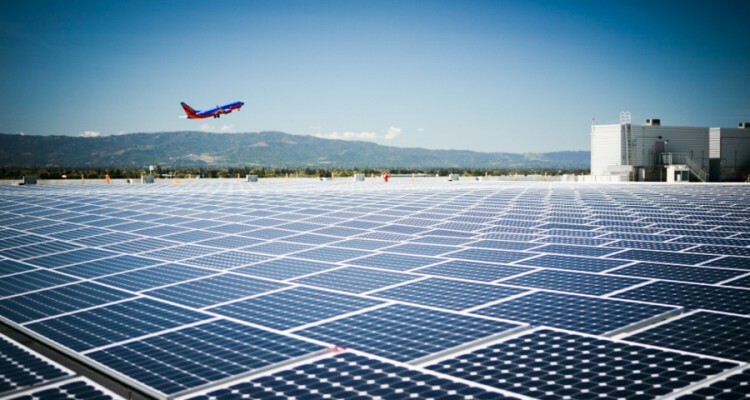 Previously the airport had installed 100 kW solar Plant on the roof top of the Arrival Terminal Block in March 2013. Approximately 400 – 250 W of solar panels with five 20 kW Refusol inverters were installed by the Indian Kolkata based solar company Vikram Solar. Later CIAL installed a 1 MW on the rooftop as well as on the ground in the Aircraft Maintenance Hangar facility, installed by India based Emvee Power. Airports around the country are planning to Go Solar! It is a great step taken by one of the busiest airports in India and should pave the way ahead for other organizations as well. An airport is a busy place and has large requirement of electricity for lighting, air-conditioning, runway lights and navigational aid. The Kolkata international airport is also expecting to install a 15 MW solar plant. The airport at Jaipur Rajasthan has already installed 100 kW and is expecting another 1800 kW (1.8 MW) as ground mounted solar PV Plant. Similarly airports at Jodhpur, Amritsar, Lucknow, Varanasi, Chandigarh etc. are also planning to go solar! The Airport Authority of India is also ready to invest in these solar plants from its own budget, alongwith with private developers in a 25 year contract. That’s great to have large solar system in Kerala airport. We are the best leading integrated solar energy solutions company providing innovative solar power solutions for residential and commercial in Kerala Region. We offer end to end solutions for solar power, LED lighting, surveillance and security, uninterrupted power supply, energy audits and more so you can be a part of the efforts towards a green and clean planet.